Satellites show 2014 was NOT the hottest ever spring (or winter or summer or autumn) in Australia. The headlines are burning around the nation: 2014 was the hottest ever spring! Except it wasn’t. The UAH satellite coverage sees all of Australia, day and night, and are not affected by urban heat, airport tarmacs, “gaps in the stations”, or inexplicable adjustments. Click to see the other “not hottest” seasons in Australia. DATA Source: Supplied from John Christy. This is an updated version of the TLT data available here. Readers, we need help to pay the bills. If you value having an independent analyst to provide the graphs that the ABC, CSIRO and BOM won’t provide, please chip in to cover our costs! Donations page here or Direct deposit and Chqs here. You the readers keep us going. We’re grateful. Thank you! 289 comments to Satellites show 2014 was NOT the hottest ever spring (or winter or summer or autumn) in Australia. I have been working outside for years and this Spring was not hotter than anything I’ve experienced in my time in Brisbane. But then again…the [SNIPs] would melt like ice creams on a hot oven if they ventured outside their controlled environments. So you’re saying Australia’s record not that important but globally the temps are still rising. Not Adam of the (<em same name as the) Institute , surely? Gees.. NOW is not 34 years ago.. bozo !!! seriously, where DO they get these clowns from. Just think, Adam, 34 years.. probably 2-3 times your age !! Thanks Jo. I did not realize that satellites existed 300 years ago. Adam has never heard of the little ice age, apparently. Of course, according to Mann’s hockeystick, the WMP and the LIA never happened. So you think climate has only happened since 1979. No wonder you are confused !!! I disagree scaper, I’ve been working outside too around Brisbane and it definitely is the hottest I can remember, not only that a stack of heat records were broken to back me up. But then you wouldn’t trust no damn lying liberal thermometer would you? Damn this new fangled measurin’ ‘quipment. They might be colourless on the outside but they’re goddam red in the middle, it’s a commo plot I tells ya. Poor Fin, grandma finally let his outside to do some work !! Its not the current thermometers that are in question, its BOM’s squashing of all past temperatures that makes your statement about record temperatures MEANINGLESS. Here is what BOM does to Amberley. With such falsification of the record it becomes very easy to call a “new temperature record” on even just an ordinary warm day. I disagree scaper, I’ve been working outside too around Brisbane and it definitely is the hottest I can remember, not only that a stack of heat records were broken to back me up. But then you wouldn’t trust no damn lying liberal thermometer would you? Damn this new fangled measurin’ ‘quipment. Yeah, well, Fin, just wait a few years until the BOM has properly assimilated and homogenized the current thermometer records and you might find that it is not so hot as you thought. In order to continue to report the ‘hottest evvvvaaaaa year’ the records from each preceeding ‘hottest evvvaaaaa year’ will need to be adjusted down to maintain the myth. I believe this may be the ‘final solution’ the Global Warmists are searching for. This way they can stretch the Little Ice Age all the way back to before the Medieval Warrm Period and expunge that anomaly forever from the history of Climate Science. In the UAH data, by my calculations, December needs to register an anomaly of 3.36°C to make 2014 the “hottest evvvvaaa’ for Australia. And the highest ever December anomaly has been 0.87°C in 1997. Very soon we will be inundated with claims of hottest year/season/month/day/nanosecond ever! Honestly, what is Jo on about. ANY goldfish will tell you it was the hottest period in living memory! tic – tic – tic – Oh yeah , you are right Iconoclast. Maybe I just couldn’t remember the right word. PS Did you read the article in the Oz today about the ‘peer reviewed science’ regarding the effect of pesticides on those poor little honey bees ( sniffle, sniffle, sob ) being well…. maybe faked, maybe actually pal reviewed then fed to the WWF who lobbied the policy makers who then banned/suspended the use of same pesticides – with economic consequences? I think Goldfish syndrome may be more widespread than anyone can remember. Good post. PR tricks won’t stand up to hard data. Keep showing the facts. We are hearing the same things here, hottest year, hottest November, etc. But Chicago has broken low temperatures records that stood for 130 yr. All over the eastern US low temperature records have been smashed, etc. But, the PR machines are churning our “hottest ever” headlines. But Jo is using PR tricks. Telling it like it really is, is one of the most devastating potent tricks you can pull. It is especially potent when your opposition can’t use it, for fear of sending the wrong messages. It was a tactic used to devastation effect by the BBC during WWII. How times have changed. The Beeb and the Met O are orgasmising over the Hottest Year EVAH! up here. Jo’s post shared on my FB page. In WWII, the battles fought were against tyranny. Today, the battles are more subtle. Replace mass resources, weapons, and tactics of attrition with social tools like media outlets and internet campaigning. However, the fundamanetals haven’t changed…Its still about those who want the power to dictate others to their “utopia” VS the truth and leaving people alone. Ironically, the more politically focused they are to impose upon others, the more it turns off regular folks out there. People see these pro-Climate folks blatantly ignore what is happening in order to push an agenda. Its like they are trying to convince others that water isn’t wet or 1 + 1 = 3, and bombarding the place with campaigning (under the cover of science or some organisation or person of authority, in order to sound legit)…They even try to use celebrities to catch the young crowd. Recent numbers in Australia and America indicate most people do NOT give a crap about Climate Change. Its right down the bottom of their priorities in life. Effectively, the PR has failed. Right now, its loonies and misled fools who still push this agenda. Regular people care more about jobs, health, economy, etc. This war will never end, they will keep trying until they get their way. They don’t care of the consequences they cause because they themselves won’t be personally affected by the results they produce. Which means the bad news for folks like us is that we can’t ever give up or go silent. We’ll also have to play a role in undoing the mess they’ve caused. (Voting people out, exposing BS, writing our own material based on research and asking questions, etc.) …This isn’t a sprint. Its a marathon. Whoever lasts the longest and can make their case, wins. The good news is that truth is on our side. When the public realises its been lied to in a big way, they are very unforgiving. That’s why its best to not BS and be straight with them! ‘They cannot speak the truth because they are driven by a political agenda’, says him with a forked tongue! Don’t be rude to him BA4 — he was including you in that statement — there, you have found fame, at last! Surely telling it like it is is not playing the game. It’s below the belt. It leaves your opponent nowhere to go. Yes, bit of a bugger, that. And all Americans have to do is look out the window and think,”WTF?” That big mass of cold air over the US is giving us a milder than usual Winter so far. Once again, American suffering shields Europe from it’s own follies. At least you’ve got the cheap energy to deal with the cold. If Europe gets a cold period, 400,000,000 people will have their existence made even more miserable by the Green Blob. You are welcome Kevin, I’m awaiting my Novemburrr natural gas bill. Around here it was the 7th coldest November since the beginning of record keeping. It felt more like January than November! Same in the UK. The BBC main news program last night trumpeted that “2014 may be the hottest year ever”. Poor dears, I can only imagine they are trying to prop up their pension funds’ green investments, which if they were to collapse might well wipe them out (which the govt would no doubt bail out with more tax payers money)! Whether it is the hottest ever really doesn’t matter only if the heat is directly caused by man. If it is just nature doing what nature does then it is meaningless. The pause, hiatus whatever it’s called this week proves that CO2 emissions don’t have a big effect on temperatures so the warming, cooling must be caused by other factors, some we may not be aware of. I realise the warmists use any rise in temperature, even if it smaller than the error bars, as proof of their pet theory. The satellite data is a threat and I wonder that Barry Obama hasn’t stopped the satellite program to prevent such contrary information being available. Because very few satellites are just single purpose, today. Many have military applications as well, since it shares the cost. But you haven’t heard that from me, OK? Either he hasn’t got a clue, or he is not interested in taking charge of his department. It that is his best effort then I don’t care for the Liberal Goverment anymore and will find someone else to vote for at the next electiopn. The outcomes of the panel will be released publically. Australia’s climate record and the methodologies used for analysis and maintenance were independently reviewed by international experts to ensure quality assurance, transparency and communication. The 2012 review concluded that the Bureau’s data and methods for climate analysis were among the best in the world. Let the experts worry about the facts, you look at the authority. Hey, stupid, the BOM has released a ‘how we homogenize for dummies’, you should read it (if you can). Don’t waste my time again. Whoops, posted that too fast and should have added the /sarc tag. Now let’s see, I wonder who will be on the “panel”. I thought that you had put a smiley face at the end! I thought, no need for that It is not a joke. Then I looked again. Indeed it is not a joke. ABC 24 have been on about this all bloody day ! Hey, what’s more, if the ASC can’t build a canoe, why would you think the BOM can read a thermometer ?? This pants wetting (SNIP?) is all about the Lima circus. I see in the MSM that Julie Bishop (Gina’s friend sceptic) is to be chaperoned by Andrew Rob (ANDEV sceptic) on the talk fest and she is not happy because Abbott believes she can’t be trusted? This has shades of the Rudd/Gillard showdown, 2010. Would love to divulge the heat emanating from Abbott’s move and it is not global warming. Interesting times ahead in the new year. Bishop stopped the government signing onto the China Infrastructure Bank, for reasons of national security. Barnaby and Andrew Robb were greatly displeased with her, not to mention Paul Keating, so I suspect Bishop has considerable clout. Does anyone know what Julie Bishop’s green politics actually are? Did she oppose the ETS? Yes. Rolls her eyes when global warming is mentioned. Julie/green politics is an oxymoron. The MSM are beating this Julie Bishop Lima story in all directions, and they would be shocked at the percentage of cynicism towards them from the general public. Though despite the cynicism the general public have been conditioned to be compliant with a ‘what can I do about it’ attitude. I think it is an alarmist MSM beat up. Julie Bishop is a very intelligent woman which makes it impossible for her to be an AGW alarmist. Also she was the first to get stuck into Obama when he linked his imagined global warming (he mentioned Australian warming – poor silly bugger he got that one wrong too) to the future destruction of the barrier reef. Further she implied a few days ago that the only alternative to coal in Australia was nuclear power. Alarmists generally don’t do that. They mindlessly mention renewables as a coal alternative. She did say she would challenge the big emitters to see if they were fair dinkum. That sounds like a good start. She is smart enough to know that few if any of them have met previous targets such as Kyoto. Interesting that Greg Hunt is not going. Perhaps Abbott does not trust him. Though of course to date he is proving to be an anti-green Federal Environment Minister. More like bottom of the stream media. It was a fairfax report. The same propoganda rag for the left continues to run polls on how much better Turnbul would be as leader…….for leftys who don’t vote liberal. Andrew Robb is the reason we don’t have an emissions trading scheme. He is the reason that Abbott eventually became prime minister. It’s only commonsense that he be there to tell these political charlatans that we wont be part of it. She’s a big girl and is quite capable of looking after herself. I saw Julie Bishop on question time yesterday and she seemed to be O’K with Abbot.Might have been a rumour started by some of the Green Blob Mob! figures are not the CAGW crowd’s strongest point. Figueres is a case in point! Christiana Figueres: “$100 billion is frankly a very, very small sum”. “We are talking here about trillions of dollars that need to flow into the transformation at a global level,” she added. She said $90 trillion would be invested in infrastructure over the next 15 years. ***Figueres described the $100 billion as a “numerical proxy” for the trust developing countries need to have that funding for their climate change activities is actually coming forward. New Clean Tech which is resilient and highly reliable…. UC coal fired power, and nuclear. Also provides much needed plant food for world food production. Old tech, from last century and before, and is unreliable and crappy….. wind !! Also destroys the environment and the creatures that live in it. There is only one logical choice, and that is the New, Clean, Greening technology of the modern coal-fired power station. Wished I had the November data to work with the other day. I could only do Aug-Oct, and was more like the winter graph, with 2014 well down. How come John gets the data first !! She is not reliant on carrier pigeons. I typed John, as in John Christie… not Jo. It was a joke !! When I look at those graphs, I can almost see a straight line running along the zero mark. I really do need new glasses. I sent Jo a graph of the whole Australian monthly data set. If you take any credence of linear trends, it shows a very tiny warming of 0.165°C per decade, over the satellite period. I wouldn’t call 0.165 degrees per decade very tiny. Unnoticeable, well within the bounds that would discriminated it from zero. What, I wonder, ‘should’ the temperature of the world be doing? Just rolling along at a perfect 0.000000; flat as the nullarbor? Who knows, Its recently been higher,(MWP, RWP etc) and its been lower, LIA. With the amount of energy that the sun has been putting out over the past several decades, I’m amazed we aren’t tracking much higher right now. Even now, with the smaller than recent sun-spot count, the amount of stuff that actually penetrates into the oceans is still very high. The extra CO2 almost looks like it is providing a cooling effect !! Possibly due to the extra vegetation. I hope that its not, other wise its going to get mighty cool in the next few/several years as the solar output tapers off when SC24 decides to decline. Fortunately we have one massive big heat sink called the oceans, so cooling can’t happen all that quickly. !! Imagine temperatures jumping a couple of degrees in 25 years (1195-1220) a clear example of regional warming. It may have been caused by a CO2 burp, but the evidence suggests it was an active sun, which produced positive NAO. The transition into the LIA was probably coupled with La Nina conditions and cool IPO on the other side of the planet. Imagine temperatures jumping from glacial (Wisconsin Ice Age) to interglacial (the Holocene) in THREE years! Now that is what I call global warming! It happened and it was natural and Al Gore and his buddies know it. Richard B. Alley of the U.Penn. was elected to the National Academy of Sciences, chaired the National Research Council on Abrupt Climate Change. for well over a decade and in 1999 was invited to testify about climate change by Vice President Al Gore. In 2002, the NAS (alley chair) published a book Abrupt Climate Change: Should We Be Worried? That is amazing Gai, what do you suspect is causing these spikes? Even closer to our own time we have the 1878 jump which needs to be explained. Might have something to do with the sun, but the speed at which it operates makes me wonder how all the oscillations coincidentally coordinated out of this chaotic system. ‘With the amount of energy that the sun has been putting out over the past several decades’ which has very little, if anything to do with the current rise in temperatures! Proof the co2 is causing AGW, without relying on computer models and the IPCC! The sun “… which has very little, if anything to do with the current rise in temperatures!”? You are such a dim bulb! I know its difficult for you, BA4, but you need to put forward something that you have READ. !! Do… you… under… stand. ??? There hasn’t been since the 1998-2000 El Nino finished. Yet a big rise in CO2..
You should change your name to BAffled !! Answer: “Skeptics” have all kinds of positions on climate science, depending on their personal beliefs and feelings. This video addresses those critics who claim there is no evidence for the link between CO2 and global temperature. Whether you want to call such changes “catastrophic” or benign, or terrible, or bad, or good is your feeling, and therefore outside the scope of the science. Completely and utterly wrong. An alleged physical effect (‘catastrophic’) is not merely a mental epiphenomenon. The reason countries are spending billions (trillions?) is to avoid the ‘catastrophic’, ‘terrible’ or ‘bad’ physical effects induced by CAGW. If CAGW is none of those things it is not a problem and no money needs to be spent on it. I suggest that what you aren’t taking account of is the overall picture. Look at the temperature drops in some years and the rises in other years relative to the 1981-2000 thirty year period. The temperatures oscillate, and vary from year to year – by tiny amounts only! To put a trend line through this is surely meaningless. These graphs describe what’s happening, they’re a dynamic account. I’d say that this shows how remarkably well the planet adjusts itself. Yep, the planet is remarkably stable, especially when you consider the barrage it took from the sun over the latter part of last century. ! Let’s hope it shows as much resilience once this present SC24 decides to drop off. !! No, but the UKMet are calling 0.01C (with an error margin of 0.1C) the hottest evah! If you see a line near zero you need some BOM Goggles, they make a ridiculously exaggerated upwards trend (looks like a hockey stick) and you will find even the ugliest unscientific abortion very attractive, they do have their limits and cannot overcome the ‘Milne Effect’, actually due to horrible experimental results this testing is banned in all countries, even North Korea. Just tilt your head !!! Haven’t you noticed the standard leftist stance ? Nope, that doesn’t work, my brain still keeps giving me the same response. Maybe that’s my problem all along. Bemused lets look at the UAH & RSS Global Satellite Temp Graphs – the former clearly shows at least 16 years of Global Temperature flat-lining while the latter shows 18.1 years of Global Temp flat-lining as highlighted by Lord Monckton last month. But please note that “Warmist” experts, if asked to show these graphs to govt leaders, will do so, that is tilted slightly anti-clockwise, just enough to perpetuate the “AGW Myth”. Now why doesn’t BOM apply these Global Satellite Temp Graphs charts in Australia? Pretty obvious hey – as I keep saying, BOM like the Met Office in the UK, are “Warmist” to the core. Just look at BOM’s website and do your own due diligence. As the next “Grand Minimum” kicks in later this decade, it will be interesting to see how these two large govt funded meteorological entities defend their “Warmist” positions as “Global Cooling” rears its ugly head with more “Polar Vortex’s/Vortexii” taking centre stage. As you can see, everything is basically flat-as, although it look like Gavin is trying to push up the end of 2014 in GISS to help with the “hottest heffer” fabrication. !! The “hefferlump” in the room eh? Yep – ya court me out – spellin is not me stwong piont. The global mean temperatures for January to October are based on worldwide instrument readings compiled by the Met Office and the University of East Anglia (UEA), known as the HadCRUT4 dataset. The Met Office said that the final value for the year will be very close to its central estimate of 0.57C for 2014, a forecast it made at the end of last year. The ‘pause’ is supported by hard data and is a ‘myth’ only for the rhetorical purpose of those at the UN trying to inflate the CAGW meme. Mean while the Great Lakes (USA) are more than 6 degrees colder than normal and started freezing more than two weeks early. Russia, Iran, Serbia, Austria, Czechoslovakia, Turkey, Romania not to mention Canada and the USA have unseasonable snow and ice and power outages, with people stranded… and not one word in the propaganda news outlets. Without the internet and skeptics like Argiris Diamantis diligently searching the foreign news media we would not have a clue that it has been darn cold in other parts of the world. If any of the human race remain after the efforts of the green blob this will be known as the New Dark Age. And if it was the hottest, or if it was the umpteenth coldest – so what !!! The average of hundreds of spot measurements of one small continent over a three month period is really inconsequential. The average of hundreds of spot measurements of one small continent over a three month period is really inconsequential. Agree with what you say Gary.Maybe 3 months is inconsequential. However Australian temperatures have a disproportionate weight in the global record because of our large contribution to the Southern Hemisphere data. We now have BOMgate. This slamdunk evidence is wasted here and should be brought to the grateful attention of the CSIRO etc , that is if they have time off from orchestrating conspiracys. To Kevin Hennessy, senior research scientist at CSIRO atmospheric research, “That (medieval) period, while it was warm, is not warmer than the last part of the 20th century. The last decades of the 20th century were at least the warmest in the past 1800 years,” he says. He says the CSIRO stands by the long-range forecasts for Australia – based upon a dozen or so computer models. Good. So when they are proven to be completely incorrect, he and his brethren will obviously financially warrant their error and reimburse those who have lost money as a result of his flawed advice. Look forward to the class action court case then. Should be fun to see them “stand by their long-range forecasts” in a meaningful way. I would not rely on anything about climate from CSIRO. Even the alarmist crew at UNSW laugh at CSIRO’s efforts !!! We have 2 options…… all the world’s leading scientific bodies are in a global scam ( insert some sort of reason here ) when we all know they could’nt organise a bun-fight in a bakery, or………..they’re correct because they’re doing their job. And I defy you to contact the political boards of any of those bodies and ask to see the survey of members done to show that the members actually back the political statement. Can you use your socialist mates to do that ? I DARE you. ! btw, I am a member of AGU.. I never got asked !!! I was a member of the American Chemical Society and I never got asked either. So I quit. My Husband was a member of the American Physical Society and he did not get asked either. Actually there was such an uproar from the members of the American Physical Society that they are revisiting their position. Nobel laureate Dr. Harold Lewis resigned and Nobel prize winner Dr. Ivar Giaever resigned as a Fellow from the American Physical Society in disgust over the group’s promotion of man-made global warming fears. We need to keep reminding people about these stories. When eminent people do not want a bar of what is going on, the less eminent of us sit up and take notice. Since when did scientific institutions have political manifestos ?, I could put it on a T-shirt next to Che. The consensus views on evolution , age of the universe, 9/11 are almost as strong and yet are doubted by some ( with ‘evidence’ ), should we take them seriously too ? . The consensus view of climate change is actually very weak. In any real science it would have been dumped as a FAILED hypothesis long ago. You still haven’t pointed to one paper proving that CO2 causes warming ion an open atmosphere. This is what is known as a false dilemma. ‘The world’s leading scientific bodies’ can be wrong for reasons other than ‘global scam’. Indeed the history of science regularly shows the ‘consensus’ position to have been falsely ascribed to. Second: the ‘world’s leading scientific bodies’ is not an authority that can be used to ground an argument from expertise. Fallacy. Third: there can be no authoritative expert opinion on CAGW because the field is not settled (as demonstrated by repeated failures in empirical prediction). Contests about the existence of CAGW are therefore necessarily resolved on the facts; facts which show: no global warming. No, you have already arbitrarily reduced the field of possible explanations prior to applying occam’s razor. The simplest explanation is, in fact, that co2 does not cause CAGW (no global warming despite a massive increase in co2). The theory of CAGW is only saved by adding an additional theoretical postulate to explain away the predictive failures: e.g. warming is going into the oceans or one of the other 50 excuses for why CAGW hasn’t happened despite a massive increase ion co2. You’re adding unnecessary complications, sometimes the majority view can be the right one , please dont mention Galileo. You’re making deeper appeals to the conspiracy explanation, again , even less likely. The whole peer review process must be broken, shall we replace it with Lord Monckton to vet everything ? Frank: please stop tugging your forelock and to the perceived ‘science’ and let’s have some figures to show exactly what your reasons are for offering the comments you do. Its not for me to provide evidence, that’s been done to death and no amount of science will convince the deniers. Put us all out of our collective miseries and submit proper evidence, science has’nt stopped working , there is no socialist conspiracy. Extraordinary claims require extraordinary evidence. Theists use similar arguements against atheists. That’s very fortunate for you, now isn’t it. !! Because you would have extreme difficulty doing so. Please provide one paper that proves that CO2 causes warming in an open atmosphere. As you say, extraordinary claims require at least some evidence, except in climate science. ! Griss, nicely put. A truly rational comment with a minimal amount of abuse. I am impressed. 1. Courts of law work on evidence. It is a formal exposition of Motive, Means, and Opportunity. It can be argued that, “Evidence” applies to science, but I don’t buy it, because it is hard to show motive without delving into the realm of conspiracy. Conspiracies may exist, of course, but they are very hard to prove. 2. Science works a formal exposition of Hypothesis, Observation, and/or Experimentation, and/or Prediction, Publication, and Independent Verification of experiments or predictions. It is hard to mount controlled experiments in natural systems, like the entire climate, especially when you only have one, so I discard that option. That leaves us relying on Observations and Predictions to demonstrate the Hypothesis, or otherwise. The logic is linear: If my hypothesis (whatever it is) is true, then these (verifiable observations) will occur, and will continue to occur. If one or more observations fail to occur, then my hypothesis is falsified. At that point, I need to investigate why my hypothesis failed, and based on the investigation, formulate a new hypothesis, and a new set of predictions. 3. Climate Science proceeds, using the process I describe in point 2. With two notable additions: a) There is presentable evidence that data has been modified, using various techniques, in order to better align with the predictions — something that is not part of a recognised scientific approach; and b) There is a reluctance to publish any information regarding the raw data, represented by the observations, nor the means and reason for its modification, nor how valid conclusion can be drawn from following such a process. 4. Without access to the raw data, it is impossible for anybody to “Put us all out of our collective miseries and submit proper evidence”, such evidence is withheld, at source. 5. Notwithstanding any of the above, and to flagrantly misquote Einstein, “No amount of homogenisation can prove Climate Change to be real. But one failed climate prediction can prove Climate Change to be false”. We have several instances where predictions have significantly failed to materialise. sorry Don’t know what’s come over me. ! The whole peer review process must be broken…. Well at least you have that part correct. A pooled weighted average of 1.97% (N = 7, 95%CI: 0.86–4.45) of scientists admitted to have fabricated, falsified or modified data or results at least once –a serious form of misconduct by any standard– and up to 33.7% admitted other questionable research practices. In surveys asking about the behaviour of colleagues, admission rates were 14.12% (N = 12, 95% CI: 9.91–19.72) for falsification, and up to 72% for other questionable research practices. You read that correctly scientists said that 3/4 of their colleagues practiced ‘questionable science’ and 14% engaged in outright FRAUD! Your one article is proof of the effectiveness of the scientific method and peer review process , crap science is eventually called out. This same process has been highly critical of denier submissions , so now it is deemed corrupt, you cant have it both ways. The reality is that if you have valid complaints regarding doctored/ withheld data they should be directed at the appropriate body, instead you’re here. The institutions have processes for you to follow, you seem to have been knocked back, again, a choice between extremes, a conspiracy ( just ask Griss ) or your submission was unsound and they’re sick of time-wasters. Frank, you are the one with the conspiracy theory, not me. I put it down to greed, ego and incompetence. I see at least 2 of those in you. Frank it was never an organised conspiracy. The media beat it up and CC took on a life of its own, with politicians and scientists happily jumping on the bandwagon or shamed into doing so. If the media had played watchdog then none of this would have happened. As others have pointed out, the hiatus means the theory has failed and we need to consider the new reality. And there you are quoting authority again when, when the field is NOT settled and there is no valid ‘consensus’ position available for you to hang on to. Oh, and saying that, the fact that a consensus can be wrong is an appeal to FACT not conspiracy: read e.g. Kuhn, science evolves by revolutions because the scientists that hold to one ‘paradigm’ will not be swayed by the new ‘paradigm’ even in the event of overwhelming evidence. i.e. ‘groupthink’ is a well known feature of the scientific enterprise (common indeed in many fields of knowledge and something always to be striven again). You seem to like erecting straw men. Your response bears little relation to what I actually wrote. First, you are the one squealing ‘conspiracy’ and thereby inventing a straw-person for your attack. Second, your response is contradictory, if there was an overturned ‘groupthink’ then the ‘review process’ obviously did not work ‘fine’: irrationally holding to a set of beliefs (groupthink) is not logically compatible with a ‘review process’ that works ‘fine’. Third, your repeated appeals to consensus are irrelevant and fallacious (the field of climate science is not settled). Fourth, the example of scientific process you have provided is an an priori idealization. Why is it always the warmist trolls that mention “conspiracy”? Do they know something we don’t know? And yes, in climate science at least, peer-review is thoroughly trashed, been put through the shredder. All these climate models based on CO2 failed, proving CO2 is not a factor. Beleive none of the answers. The current temmperature is well below Hansen’s “zero emissions growth” scenario despite the fact that the atmospheric percentage of plant life continues to increase. Hansen’s hypothesis PROVES that CO2 is not causing any warming. So if they couldn’t organize a bun-fight in a bakery why would you expect me to believe they would have a clue about the climate. If they are that inept then what they claim means even less than our already low opinion of them. We actually have more than 2 options. But none of them include their being correct because they’re doing their job. Again , your most logical answer is a global conspiracy, is all other scientific investigation similarly tainted ? Again , your most logical answer is a global conspiracy, is all other scientific investigation similarly tainted ?. Frank, what a wonderfully naive view of things you have. Most scientific studies are wrong, and they are wrong because scientists are interested in funding and careers rather than truth. -Richard Smith, former editor of the British Medical Journal. There is increasing concern that most current published research findings are false. The probability that a research claim is true may depend on study power and bias, … Moreover, for many current scientific fields, claimed research findings may often be simply accurate measures of the prevailing bias. You cite 2 people as ‘proof’ that research is dodgey, appealing to their authority and you call me naive ? I didn’t cite them as ‘proof’. I cited them as evidence against your erroneous view of scientists as the unimpeachable purveyors of truth. As for the claim I have made an ‘argument from authority’. I say ? So ? I have not said ‘arguments from authority’ (properly we might call them arguments from expertise) are per se bad. I have said that arguments from authority that run contrary to established facts or grounded in political groupthink are invalid, yes. An argument from expert opinion is, in any case, defeasible, so if you want to say there is something wrong with the claims made, go ahead. You site 59 papers out of 11,944 and call that a unanimous consensus. You support research that can’t be replicated and you call that science. is all other scientific investigation similarly tainted ? This month has seen three egregious examples of poor scientific practice… Second example: last week, the World Meteorological Organization (WMO), a supposedly scientific body, issued a press release stating that this is likely to be the warmest year in a century or more, based on surface temperatures. Yet this predicted record would be only one hundredth of a degree above 2010 and two hundredths of a degree above 2005 — with an error range of one tenth of a degree. True scientists would have said: this year is unlikely to be significantly warmer than 2010 or 2005 and left it at that… the year is not over, so why the announcement now? Oh yes, there’s a political climate summit in Lima this week. The scientists of WMO allowed themselves to be used politically. Gees, you seriously are pushing this conspiracy theory of yours, aren’t you. ! Here you are again, deflecting the points made with irrelevancies because you have no figures to argue your case and show us what YOU think. You don’t show any sign that that you’ve any interest in data whatsoever or have ever studied any in order to form coherent ideas of your own. You do (hopefully) know what the atmospheric concentration of CO2 is for example, what ‘ppm’ stands for, and how CO2 is measured – plus how long atmospheric CO2 has been measured for? This would be a good start! You show me the basis of how I am measured, and rewarded. And I will show you how I perform, and support the team. That is a basic principle of contract. No conspiracy is required. ( insert some sort of reason here )…. “ill informed” as very obviously too little is known about Earth’s climate eg. the nature of the CO2/water vapour feedback and the effect of clouds on incoming short wave and outgoing infra red radiation. Just two of very many climate variables that the present state of the science is basically ignorant of. Real scientists, such as Freeman Dyson, as distinct from those who are not any smarter than your average meteorologist masquerading as climate “scientists”, has pointed to the fundamental gaps in so called consensus climate science that discredit its dogmatic and invariably alarmist predictions. You forgot the real reason Frank. Most scientists have families to feed and mortgages to pay. Honesty and integrity comes at a high cost. Because I am female with a husband who had a good job I could afford to stand on my principles and refuse to lie when directed to and consequently get fired and blackballed. Most scientists do not have that luxury and it is a luxury. That is why most skeptic scientists are old and retired or at least has tenure. “I had the privilege of being fired by Al Gore, since I refused to go along with his alarmism. I did not need the job that badly,” Happer said this week. Happer is a Professor at the Department of Physics at Princeton University and former Director of Energy Research at the Department of Energy from 1990 to 1993, has published over 200 scientific papers, and is a fellow of the American Physical Society, The American Association for the Advancement of Science, and the National Academy of Sciences…..
Happer, who served as the Director of Energy Research at the Department of Energy in 1993, says he was fired by Gore in 1993 for not going along with Gore’s scientific views on ozone and climate issues. “I was told that science was not going to intrude on policy,” Happer explained in 1993. “I have spent a long research career studying physics that is closely related to the greenhouse effect, for example, absorption and emission of visible and infrared radiation, and fluid flow,” Happer said this week. “Fears about man-made global warming are unwarranted and are not based on good science. The earth’s climate is changing now, as it always has. There is no evidence that the changes differ in any qualitative way from those of the past,” he added. Frank, please! You might only be able to come up with 2 options but most of us are a bit sharper. It doesn’t take a conspiracy for people to behave similarly. It doesn’t take much exploration to discover that humans are actually pretty vulnerable to suggestion, group-think, vanity, and greed. It doesn’t take but a bit of reading history to find examples of the trouble people get into because of the above. You Frank, might be one of the gullible that believe that scientists as a group are perfectly immune to these traits but again, most of us are a bit sharper. And frame my face for all occasions. A sharp person with a decently argued submission would’nt waste time here. Just submit it and listen to the collective head-smack of thankful acknowledgement. Game over, instead we get lame excuses . That explains why you are here wasting your time. You are neither sharp (quite dull and boring actually), nor do you have any decently argued submissions. I have yet to see anything of yours that is more than empty rhetoric. You seem to be a very lonely person, seeking attention. Poor thing. Yep, I think the count is well over 60 now ! rank seems to be fixated on this conspiracy stuff. “We have 2 options…… all the world’s leading scientific bodies are in a global scam ( insert some sort of reason here ) when we all know they could’nt organise a bun-fight in a bakery, or………..they’re correct because they’re doing their job. That is not science., but advocacy. A couple of times here on Jo’s log, a couple of times on WUWT and a couple of times on Judith Curry’s “Climate Etc” blog where with that academic line up one would expect a full and complete answer. But nothing, except an acknowledgment from a couple of Judith’s denizens that what you can’t see and find is just not there. After 25 years of very expensive, ever expansive publicly funded climate research, could somebody somewhere please point out one single example where climate science as currently practiced has been of ANY visible, perceivable or useful and useable benefit at any level to our national and global societies and industries ? So to Frank and all his fellow believers in the Climate catastrophe cult, your answers to my question plus examples, please! The question is nonsense, that’s why you’re not getting many responses. Its goal is not short term like they’re trying to develop a better toaster, the aim is to reduce the impact of AGW , a very long term task. … there is NO IMPACT of CO2 what-so-ever. Oh thank goodness… I can just imagine what the rank incompetence of these twits would come up with. !! I like my toast in the morning, not in the afternoon. !! No, just very much in the TOO HARD basket for the AGW alumni to answer. !! and while you’re at it…..
….have you got a link to that paper yet.? Your answer is nonsence because there is no AGW, none. Not in the short term and not in the long term. Taxpayers have the right to question how their taxes are spent. They can expect that there will be a benefit from that expenditure. Where is the benefit to taxpayers who are funding this? ROM’s question seems eminently reasonable and sensible to me. Frank’s answer seems the opposite to me. Let’s have a proper answer please…it would be good to know if all those billions and trillions of pounds and dollars actually produced any good effects anywhere and at any time. If CO2 caused global warming then I would support your theory, but the hiatus proves otherwise. Here we have Frank, an obviously dedicated climate warming /climate catastrophe /climate change believer being given the opportunity on a skeptic blog to explain all the benefits that 25 years, a third of a life time of climate research plus close to a trillion dollars of tax payers money spent on that same climate and CO2 mitigation research, has provided to the wider community out there who have paid their taxes that funds this research. And Frank despite this opportunity refuses to disclose those benefits that have supposedly arisen from all that climate research and that close to a trilllion US dollars of tax payers hard earned spent on climate warming science. Of course you realise Frank, that to blow such an opportunity to outline all those benefits from global warming climate research will leave a very bad taste in any tax paying lurker’s mouth who comes past and reads your response to my question. Those lurkers might just get the idea that for 25 years a goodly portion of their hard earned has been poured down a bottomless climate science rat hole for absolutely no result and increasingly for no perceivable reason at all. If they had doubts before then maybe your refusal or inability to enunciate those benefits or your ignorance of any benefits at all from all that very expensive climate research might finally convince them that yours and others hard held beliefs beliefs in CAGW is all a very large load of very expensive, very useless hot cocky s**t and therefore turn them against your ideology and religion for ever. They will want to see their taxes used for some benefit to themselves and to society, not for the benefit of a bunch of hubris laden climate scientists who have never created anything of any use to society that anybody can point to. Something likely to be far more serious than the low probability of CO2 emissions from the continued use of fossil fuels dangerously warming the Earth (given that there is, according to historic climate science, a law of diminishing returns in play with respect to global temperature driven by increases in atmospheric concentrations of CO2) is the ability to feed the growing world population which demographers tell us will reach 9 billion this century. There seems to be increasing evidence that rising atmospheric CO2 concentrations of CO2 are having a positive effect on food crops some of which are setting new records. Given the hiatus in global warming despite the atmospheric CO2 concentration increasing by about 35 to 40 ppm over the last 18 years it should be evident that the crop growth potential, particularly for food crops, from that extra CO2 is something of far more significant value than any experimentally unsubstantiated negative impact on global warming. In other words the science underlying CAGW and its real significance for human life on Earth needs re evaluation in the context of adequately feeding Earth’s burgeoning human population. Annie it has produced good effects. Here are two examples of the transfer of wealth from the poor and middle class to the deserving rich. First an easy to understand one: Eco opportunist Dale Vince has made an estimated £100 million from just 60 turbines spread on 17 sites around Britain. That works out at well over a million pounds per turbine. A turbine that provides unreliable, intermittent, environmentally destructive energy. Al Gore, Goldman Sachs CEO Hank Paulson, David Blood (former chief of Goldman Sachs Asset Management) and others from Goldman Sachs co-founded London-based Generation Investment Management (GIM) in 2004. Between 2008 and 2011 the company had raised profits of nearly $218 million from institutions and wealthy investors. GIM invests money from institutions and wealthy investors in companies that are going green. “Generation Investment Management, purchases — but isn’t a provider of — carbon dioxide offsets,” said spokesman Richard Campbell in a March 7 report by CNSNews. Those carbon dioxide offsets purchased by GIM and the corporations going green would be purchased from the major carbon-credit trading firms that existed: the Chicago Climate Exchange (CCX) in the U.S. and the Carbon Neutral Company (CNC) in Great Britain. The Chicago Climate Exchange was founded by Al Gore, Maurice Strong with the help of Obama who worked for the Joyce foundation at the time. If the USA had passed Cap & Trade Al Gore, Maurice Strong and the guys from Goldman Sachs would have made a large killing in this one hand washes the other business model. Of course in looking at all the windfalls for the financiers and corporations cashing in on tax payer subsidies we shouldn’t forget the other very important aspect. By jacking up energy costs in the UK to the point that 1/4 of the households are in fuel poverty, old folks now have to choose between eating and being warm. This results in the deaths of 30,000 useless eaters a year out right. Of those old folks who do not die out right and end up in the hospital instead, the UK has another mechanism in place. The Liverpool Care Pathway (LCP) where medication food and water are withdrawn so the patient starves to death. Original news stories said As many as 1,165 people starved to death in NHS hospitals over the past four years and this was thought to be because nurses are too busy to feed their patients. More recent investigations show more than 50 per cent of all patients who died had been placed on the pathway. That is 130,000 people intentionally killed a year. In some instances patients placed on the pathway because doctors judged that they were nearing the end of their life went on to recover after their families intervened. With further digging it was found two thirds of NHS trusts using the Liverpool Care Pathway have received payouts totaling millions of pounds for hitting targets related to its use. Six out of 10 of those trusts received at least £12 million. In total the UK government is killing 160,000 useless eaters a year! What a savings! With 8,922,000 in England alone and worries about an aging population the UK has come up with a unique solution. Kill off a couple percent a year especially those who are ill and therefore more of a burden on the system. Aren’t our politicians and leaders innovative? It is a form of impost. An impost is an indirect tax, or a tribute, or a tithe, that is demanded for no apparent or tangible reason. Throughout history, mankind has sought ways of creating class structures, where one small group can access more resources than the general population. This may be because they are charismatic leaders, or because they lead a group of bullies, or because they can claim privileged information and arcane knowledge others do not possess. They name supposed enemies, or create mythical beasts, or frighten the populous with tales of plague, and pestilence, or famine, that will bring starvation and death. In so doing, they hold themselves up as being the champion, who will fight tirelessly to protect the people. But in return, the people must pay tribute, so that the person, and their assistants, and support staff, can get on with the job, and not have to be concerned with the more mundane matters of life. And in paying the tithe, the people become subservient and controlled. It happens in all cultures, and throughout all periods of history. Even Communism could identify an enemy (subversion) that needed to be guarded against and destroyed. And even egalitarian religious sects have a nominal leader. It is part of what we are. It seems to be imbedded in the survival instinct, and the way we tend to protect the continuance of our genetic makeup, through our children, and their children. It also underpins all of our social structures, and the sports that we play. There are so many believers in climate catastrophe, because so many people want to believe, nay, they need to believe in something that is frightening, so that they can then find something, or somebody, that gives them assurance that they will be secure. If we woke up tomorrow morning and found that we did not have climate catastrophe to worry about, we would find something else by lunchtime, and be paying an impost to somebody, to save us from it, by suppertime. I have a copy of the BOM data from 2004 but have not checked lately to see if it matches. I am certain funding for climate science and the associated media interest has fuelled interest in climate. It is encouraging that the Abbott government is questing the so-called settled science and it will be interesting to see if more curious people with the skills and interest to analyse the climate data can turn the direction of the herd that has blindly followed the powerful IPCC propaganda. The propaganda around the Lima gathering is sad if it is given a second thought but none of the main media outlets I read or listened to (excluding here and NoTrickZone) questioned the nonsense that 2014 is “heading” to be the hottest year on record. Facts no longer count just meaningless predictions that get repeated and gather momentum. I can see ever increasing desperation from the UN to secure funding before there is widespread recognition that man induced global warming through CO2 is negligible. UAH surface temperature observations have always been controversial because the satellite is looking through a lot of atmosphere which interferes with surface temperature measurements. The WMO standard is air temperature at 2m above ground, what is the dataset you have actually analysed? What is the geographic region of your analysis, and does it only cover land or land and water? How exactly do you define and calculate ‘Seasonal average Temp’? What is the accuracy and measurement noise on the satellite observations? Did you actually check with John about whether the data is at all appropriate for the purpose you have used it for? For somebody who appears to be a critic of the scientific process you do not appear to be very transparent with your counter-evidence. UAH data is not even slightly “controversial” compared to the adjusted, altered, homogenised and mysterious ground data which no one outside the BOM can replicate and which contradicts the historic records of the time. The dataset I analyzed is listed in every single graph, as are the details of the “seasonal average temp”. For those who know anything about satellite data it’s obvious it is TLT. Though, thanks for reminding me, I’ve added the link to the actual set below the graph, though I’m not sure it is updated with this data yet. Appreciate the feedback. Yes, I did explain to John Christy exactly why I wanted the data and he confirmed my graph and footnote. The geographic region is “Australia” which is stated in the headline and every graph. You’ll find it in the far right hand column of the UAH public datasets. Since you are a skeptic I’m sure you’ve asked the BOM similar questions about their datasets, so don’t hesitate to link to your skeptical comments made elsewhere. Do let us know if you ever get any answers about their adjustments. We’re keen to hear. The UAH satellite data may not be controversial compared to the BOM data but what are they measuring and what does it mean? I can verify the graphs that Jo has submitted. I have downloaded the data, and have run the analysis. Apart from the last point, November 2014, which I don’t have the data for, my graphs match Jo’s exactly. If you are REALLY sceptical, download the data and do it yourself !!!! UAH data is the most spatially consistent data set there is. The method does not change within a data set. The number of points does not change within the data set. If you ask BOM why these adjustments are made, you get a massive smoke screen! There is also a secondary data set, done by a totally different group, using a slightly different method and different set of satellites. It is called RSS, and matches UAH quite well. So, does that cover your question ? Not sure if this is an answer to me. Does it answer the question? Not quite. The satellite data is apparently some sort of weighted average measure of the lower troposphere temperature from ground level to about 20,000ft. My problem is to equate (or compare) this metric to the measured (adjusted) near ground temperatures of the BOM. Our satellite estimates of global temperature, which have much more complete geographic coverage than thermometers, reveal that 2014 won’t be even close to a record warm year. In fact, the satellite and thermometer technologies seem to be diverging in what they are telling us in recent years, with the thermometers continuing to warm, and the satellite temperatures essentially flat-lining. So, why have world governments chosen to rely on surface thermometers, which were never designed for high accuracy, and yet ignore their own high-tech satellite network of calibrated sensors, especially when the satellites also agree with weather balloon data? I will leave it to the reader to answer that one. » Spencer, R.W., and J.R. Christy, 1993: Precision lower stratospheric temperature monitoring with the MSU: Technique, validation, and results 1979-91. J. Climate, 6, 1301-1326. » Spencer, R.W., and J.R. Christy, 1992a: Precision and radiosonde validation of satellite gridpoint temperature anomalies, Part I: MSU channel 2. J. Climate, 5, 847-857. » Spencer, R.W., and J.R. Christy, 1992b: Precision and radiosonde validation of satellite gridpoint temperature anomalies, Part II: A tropospheric retrieval and trends during 1979-90. J. Climate, 5, 858-866. I triple dare you to submit your killer evidence for review in the real world, not wasting time here in a sheltered workshop. You’re the ones pointing the finger, put up or shut up. Also , if you remember ,you were the one to admit to believing in a global socialist conspiracy…gotta go, toast is burning. And the empty rhetoric continues from hollowman Frank. Where’s that paper which proves CO2 causes warming in an open atmosphere.. still searching???? You are the one blethering in support of a falsified hypothesis, with zero evidence to back up your ranting. Put up or shut up. !! And the evidence IS out there in the real world, and its gaining traction as people see past the lies and falsification of the alarmist non-scientists. Its open for all to review, rather than just the “pals” within the small circle of climate troughers. Poor Frank, all you can manage is an empty, boring post again. Find some substance for once.. please !! Look , you dont give a proper reply as to why the scientific community keeps rejecting your submissions, you just say where’s MY evidence ?, you’re the ones making the claims and your excuses just amount to the C word , that’s why you’re stuck in blogsville. Its like my claiming to have a dragon in my garage and I demand that YOU disprove it. Your rebuttals mostly consist of parroting back my accusations or childish abuse. Long live the scientific method. Still an empty NOTHING from Frank. No paper proving CO2 causes warming in an open atmosphere. This is the CLAIM that holds the alarmist meme together.. and its an EMPTY, UNPROVEN CLAIM !! Surely one must exist after all this billions and time? And no list of benefits.. come on.. really ?. Not travelling too well there, are you Frank. !! Even your excuses are wearing very thin. And I doubt you have even the vaguest idea about the scientific method, so stop parroting your empty propaganda. Its OLD and its BORING !! Actually Frank, as per scientific method, the onus of proof lies on those seeking to establish CAGW. They are the ones ‘making the claims’ about the Earth’s impending day of doom. Where is the empirical evidence that co2 will lead to runaway global warming? Doesn’t exist. I have to answer you because grizzle cant read. The evidence is widespread , you just choose to ignore it. Simple confirmation bias. Since you disagree, you should do something about it. If you have the goods to counter it , just get out of this sandpit and submit it to the real world, none of you are doing that. Frank misses the target yet again. Seriously, have you got anything worthwhile to contribute, because all you have so far is a big fat ZOT !! Please…. Produce SOMETHING, ANYTHING !!! So that we know you have a brain !!! Oh , were you one of those bicycle racks at Bondi ? Or did the cat get there first. NOT ONE of the many warmista apostles or hangers-on that have come here have EVER been able to produce ONE IOTA of proof for the basic tenet of the CAGW meme. And they produce NOTHING !!! I hate to tell you Frank, but the KILLER paper is just about to be published. It uses real honest data (aka measurements from the real world not models) to show where the physics used in all the climate models is flawed. This flaw is a real killer because the correct physics shows CO2 can cause no more warming. It explains the pause WITH PHYSICS based on measurements. No need to waste money on Climate parties Conferences any more. And yes I have seen this information and yes it is very compelling. What’s the bet the “climate” gatekeepers try to stall this paper until after the Paris jaunt !!! We shall see, and if so I’ll buy the drinks ! Based on your comments and behaviour here who would want your company? We can buy our own drinks. I apologise for asking uncomfortable questions that dont get answered. Just publish your evidence. I think your in-house attack dog takes the prize for poor behaviour, he’s starting to foam at the mouth, we should swap icons. No mate, its YOU that takes the cake for boring obnoxious behaviour. Right from your very post here your ignorant, yet arrogant, demeanour and lack of any sort of intelligence is an insult to everyone else here. Got that paper for us yet? Come on, you must have something to support the farce that is “anthropogenic climate change”? No you don’t. You aren’t asking unconformable questions as there isn’t anyone here, besides possibly yourself, who is at all uncomfortable with your questions. While you claim “the evidence is widespread” you don’t seem to be able to point to it. You claim “we choose to ignore it” yet when someone provides an answer to your “uncomfortable questions” you are the one who either ignores the answer or changes topic. Models are not evidence, failed predictions are not evidence. The core claim is that CO2 is causing __________, yet there is no evidence of that. If you understood the scientific method at all you would know we do not need to “publish our evidence”, when what has been published so far and apparently is your “evidence” is continually proven wrong. As to “our evidence” more gets published as time progresses, yet it is you who chooses to ignore it. Doesn’t matter what we show you, what reality is actually doing, or who does what as you are the one suffering confirmation bias, not us. We’ve been dealing with people like you for years, you have nothing new. As to griss, he is one of many who has grown tired of people like you expecting to be treated nicely as you rationalize your own poor behavior towards us. In short, you get what you ask for through your own behavior. Yep, when I see a cockroach.. I spray it. !! Thanks for the response Joanne. That is a really neat dataset. * Precision calibrated thermometers 2m above ground level say X. * Satellite radiometer measurements of the bottom 8 kilometres of the troposphere say Y. * X does not equal Y, therefore X is wrong. Pretty hard to argue with that logic! The BOM Special Climate Summary was about near-surface temperatures, down here where the people live. Even assuming the UAH data is perfectly calibrated then it still doesn’t have anything whatsoever to do with what a weather station measures, except through an extremely complex relatonship. You cover an amazing mix of things in your four short paragraphs. The BOM are damned if they do homogenise, and damned if they don’t. The Weather Watchers mentions how some of the historical thermometers where mounted. I paraphrase because I no longer have the book, but some were literally on verandahs, exposed to direct sunlight, etc.. You are not seriously suggesting that rubbish data like that should be included in trend analysis? You wouldn’t make X & Y an identity, but merely observe: X shows warming; Y shows no warming. You might then like to ask: which is the better data set? The BOM Special Climate Summary was about near-surface temperatures, down here where the people live. Down, here, where people live with all the data contamination (and adjustments to ‘remove’ contamination) that entails. Jim. It is not a question of which is the better dataset, they are measures of different quantities. I’m not sure where you live, but the last few months, and November in particular, was stinking hot in country NSW and I do not bat an eyelid to see that the daytime maximum temperature anomaly for November was +4.06 degrees. No, they both purport to be measures of temperature. One purports to show ‘hottest ever’ temperature for 2014. The other shows that is not the case. Given that CAGW predicts the LT will warm faster than the surface this is an anomalous result. The obvious answer is that there are variables (UHI, data contamination) present in the terrestrial record that are not present in the LT. Your subjective impressions of global temperature are irrelevant. 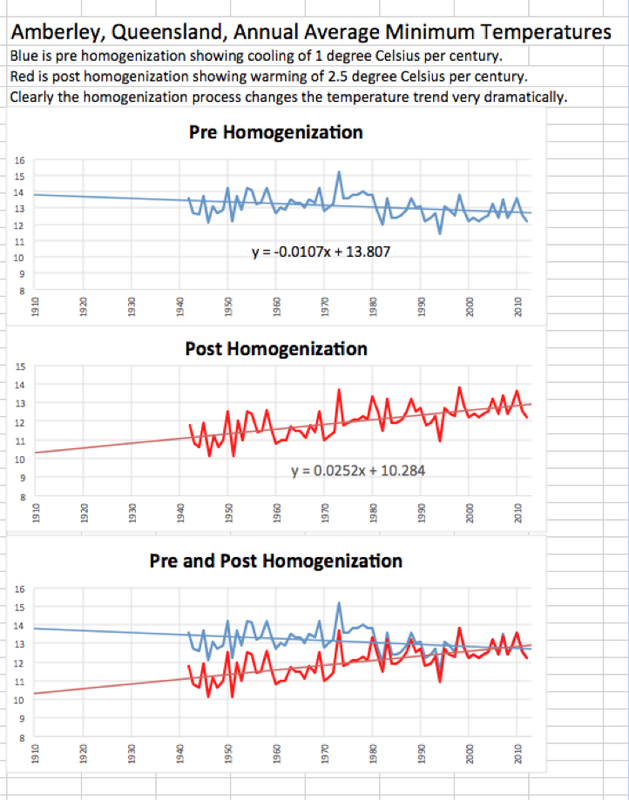 A more relevant question: why do we only see ‘world’s hottest ever’ temperature measurements in the homogenized terrestrial temperature records? Here is an example. I have a weather station here at 210m ASL, and another on a mountain 50km away at 1510m ASL. If I find my lower weather station has recorded the hottest (or coldest) season or ever, I cannot prove or disprove this statement by referring to the other site. There will be a certain correlation but it is subject to completely different levels of radiative heating and cooling and exposed to different layers of the atmosphere, adiabatic cooling, etc..
You should tell that to the BOM. -The fact of the matter is that the ‘warmest ever x’ depends on the data set that one selects. -The terrestrial record is hopeless compromised by adjustments and homogenization. -Over /the longer term/ of 18 years the LT does not show warming, even though according to CAGW theory it should warm faster than the surface. Due to cloudless skies and a ridging High pressure.We had a positive anomaly of 5 degrees for November because of those unending nor westers.Are they due to mans component of CO2 ? Lucky old you David. I was freezing here in country Vic until recently…at least I can wear summer gear at last! X shows warming; Y shows no warming. Oh, and Jim, the satellite data clearly shows the lower troposphere was also anomalously warm. X shows it was really really hot, Y shows it was really hot. Fractions of a degree in a short term record on a planet that has had much wider swings in both directions even in the recent past. The current global temperature (whatever that is) looks like it is somewhere between the temperature in the LIA and the MWP. We are near the top of the latest of a series of peaks of the Minoan, Roman, and Medieval warm periods, each of which has been progressively cooler. The whole Holocene has been one gradual downward trend. During that period, the warmer periods have been times of prosperity and abundance and human advancement, punctuated by dire times, food shortages, famine, disease of the Dark Ages, and the LIA. A tiny drop over the next couple of decade (if the sun continues on its hibernation trajectory) will take the world back to one of those dark times. The other thing that will most certainly take the world back to the Dark Ages is the adoption of the “climate change” agenda. It is a graph of temperature anomaly. This season’s anomaly is like the fourth highest on the graph! The season was anomalously warm. The satellite data shows no warming for 18 years and 2 months. According to CAGW modeling the LT is supposed to warm faster than the surface. Massive doses of CO2 have been given to the atmosphere. Yet there has been no warming in the LT.
Co2 is supposed to cause run away catastrophic warming. Anomalous with respect to the 1981-2010 seasonal average – it says it right there on the graphs. I am not saying the graph shows a warming trend, but it does show this spring was anomalously hot. Yeah, like if you have ream of paper and take one sheet off the top, it becomes anomalously thinner. So, let me see if I understand this …? You take an arbitrary period of several years, and take a seasonal average. Presumably this is achieved by adding every maximum temperature for every day for an arbitrary three month period, and then dividing by the number of days in that arbitrary three month period. This gives you an average temperature for that particular location, for those three months. You then take that location dependent average, for those three months, and add them to the location dependent average for the same three months, over an arbitrary number of years, and then you divide that number by the number of years, to get a time-bound figure. Then what you do, is look at the latest years average for those thee months, for each location, and subtract the smaller from the larger to get an anomaly. You can then say that the anomaly demonstrates a warming trend (or a cooling trend), depending upon which location(s) you choose. Cooling trends are not interesting, so you forget that, and focus on the warming trends and see whether the total warming trends for all locations, is greater than the average you calculated earlier. If it is (as you would expect for half of the time), you can jump and shout that this [arbitrary three month period] is anomalously hot. That’s cleaver. Look pretty impressive, too. I wonder what it means in the real world? i.e. does it predict ‘burning hot hell on earth’ for the terrestrial or surface record plus no warming in the lower troposphere or something completely different, like, perhaps, that the LT will actually warm faster than the surface…? Individual thermometers might be precision, but the whole surface station system is one big mess, and could never be called a “precision” system. * they are often badly located and significantly affected by local factors. * the data has been subjected to significant adjustments by groups trying to push the alarmist agenda. The surface station system is sort of like one big guess, and is massively open to gross tampering by those with a particular agenda…. and the main people in charge have proven that they are just the sort of rabid activists to make full use of that opportunity. I suggest you also look at the data sets compared. See how Gavin and Phil are pushing up GISS And HadCrut compared to the satellite data sets (which do not show 2014 as excessively warm)..
Just in time to use it for Lima/Paris. !! Seen Chiefio’s comment on GISS and anomalies? Where did you ever get the idea that the surface thermometers were precision or calibrated? So the USA stations, some of the best in the world have an error of no better than 2C. More than half of the GHCN (Global Historical Climatology Network) stations are at airports giving a warm bias AND since 1990 the amount of infilling (Data fabricated from reading many miles away) has increased from less that 5% to OVER 40% This is for the premier US data set – USHCN (US Historic Climate Network) When checked The fabricated data was always warmer than the raw data. The U.S. Historical Climatology Network (USHCN) data are used to quantify national- and regional-scale temperature changes in the contiguous United States (CONUS). The USHCN is a designated subset of the NOAA Cooperative Observer Program (COOP) Network with sites selected according to their spatial coverage, record length, data completeness, and historical stability. Gai, Its interesting how well USHCN now matches the new climate reference network since 2005. The match is actually way TOO good and can only be a fabrication on behalf of the USHCN. Note that there can be no “hottest ever” for 2014 in either data set for the US. In fact, a slight cooling trend is evident. .. in an attempt to justify all their previous data manipulation and the fabrication of the warming trend. The AWSs are expensive, precsion, Vaisala instruments, and have a strict calibration regime. The BOM has instrumentation tech’s that do nothing but check and double check the calibration. I agree with you that poor siting of the stations could be an issue at some locations. My local AWS here would easily fit into your Class 1, it is on a grassy area several kilometres from town and away from any manmade structures. It has set a few new monthly and the overall maximum temperature record just this year. Anyway it has been a pleasure but I think I’ll go now. Then why didn’t they use the Observatory Hill reading in January 2013 when they claimed the new record Sydney temperature. The 1936 temp was 45.3C, which was exactly what the Obs. Hill AWS reached. But the temperature was somehow recorded as 45.8C ??????? And really, the AWS system hasn’t been in use that long. …. just like the BOM temperature history fabrication tells us nothing! So new equipment.. against an old mal-adjusted temperature record. Claiming any record temperature is total fakery !! That was supposed to be the 4th September 1914 in both cases – but you get the point that you can’t have it both ways, Dave. You can’t disagree with one set of data that disproves another set while agreeing with one set of data that disproves another set. Particularly when the second example is from the same coordinates at the same time but adjusted to suit some ephemoral ideology of how society must be moulded. Excellent James, now if Dave does this once for every site on the continent, X becomes more wrong and Y becomes peer reviewed. Do I get my BOM appointment now? Sorry, you have to pass a “lack of scientific integrity” check first ! Hey folks – the BOM’d latest SCS is based on the area-averaged temperature observations. This is valid. It also means that poorly sited records from cities have little influence on the figure. My example about the mountain top was to demonstrate that it is invalid to make claims that information proves or disproves something that it doesn’t. In retrospect I would have served my purpose better with an example which had nothing to do with temperatures and weather stations. I do understand your statements about the homogenisation. However as I mentioned above, some of the thermometers, particularly before 1910, were literally mounted exposed to direct sunlight etc.. It is imperitive that BOM do SOMETHING to weed out such data data, I am sure you would agree. Regarding the Observatory Hill record. I am not familiar with the specifics, but if you were looking at the 30-minute readings from the AWS and then noticed the reported maximum was higher, this is normal and expected. The maximum, like what a max/min thermometer would record, is recorded and reported seperately to the periodic reports. Oh well, that explains it all then. Or it might just show that homogonising accurate historical data caused a false warming trend from the beginning. Stevenson screens were install in many places, before 1910..
and no, temperatures even before that were recorded in shade. The ONLY reason for dumping pre 1910 data is because it was a huge black mark against the BOM’s warmista meme. There is NO DOUBT that there is a definite attempt to cool the past in all of GISS, BOM, HadCrut, NCDC etc. There are even emails of these changes being discussed ! The 1940′s PEAK that used to be in all NH temperature records, land and sea,was very embarrassing according to Tom Wigley, and needed to be removed. If you visit Ken’s Kingdom, you can see the huge number of Australian sites where the raw data trends downwards, but BOM “adjustments” have created an also uniform warming trend by greatly cooling the middle of last century. So, if you IGNORE the really warm stuff around 1900, and squash the middle of last century down… of course you get a warm period. !!! You deserve all the kudos that an adjunctship avails. The WMO’s report on the state of the global climate is published every year to coincide with the UN’s annual negotiations on climate change, this time under way in Lima in Peru. Is it possible to get the same temperature charts from the BOM? And by that I mean the raw data, pre-manipulation, distortion and torturing. At the end of the day, all this green blob nonsense about the hottest year ever is to prepare the lumpen proletariat to be signed up to the longest and largest economic suicide letter in history in Paris, April next year. #theProjecttv tonight on Ten goes berserk on hottest year (2104) ever. Has wind farm Infogen rep on to support the #CAGW BS. Thinks windfarms are beautiful. Seriously I’m starting to get angry now. The mainstream media are useful idiots. Why do they continue to feed us with AGW propaganda? …The draft hands effective control of climate change finance to the World Bank; would abandon the Kyoto protocol – the only legally binding treaty that the world has on emissions reductions; and would make any money to help poor countries adapt to climate change dependent on them taking a range of actions. The document was described last night by one senior diplomat as “a very dangerous document for developing countries. It is a fundamental reworking of the UN balance of obligations. It is to be superimposed without discussion on the talks”…. In Warsaw, Australia made nearly a clean sweep of the “fossil of the day” awards for its about face negotiating position. In Lima, it has started with the same notoriety, winning the inaugural fossil of the day award – along with Austria, Belgium and Ireland, for failing to contribute funds to the Green Climate Fund, the international financing mechanism that Tony Abbott has churlishly labelled the Bob Brown bank. And in Lima, unlike some delegations, Australia has a modest office, one small room, a small fridge and an Australian flag out the front. And someone in the UN has a sense of humour because its most immediate neighbour is the United Nations Environment Program, which has warned that most of the world’s fossil fuels should remain in the ground, on one side; and to which Australia has just slashed is funding by 80 per cent. That should make for a good conversation piece. The fact that Australia has such modest lodgings within the delegation compound (even Indonesia is holding an expo with talks and presentations) is the result of Australia coming to Lima with its smallest delegation in two decades. Just 12 people. Given that the Coalition used to rib the Labor Party over the size of its delegations – particularly to Copenhagen where it had more than 100 – then the reduction in air miles is possibly the most tangible reduction in emissions that the Coalition government has achieved to date. Direct Action at work. My congratulations to Tony Abbot for a very large dose of common sense in the level of importance that has been placed on the government’s participation in the Lima climate conference. The government’s calibrated response indicated by Australia’s miniscule representation at Lima gives a true indication as to the real and actual importance of these UN climate alarmist conferences to both the Australian public and to the world at a large. In short this UN climate conference like all the others is just another gaudy dross laden, shyster infested piece of theatre accompanied by much loud and long winded banging from a vast range of completely empty vessels, a typical UN “carnie” run show that in impact and outcomes will be once again worth in some salty rural lingo, Sweet FA to both Australia and the world at large. Tony Abbott got this one right. I couldn’t stop laughing after the New Zealand TV1 news tonight, the 3rd news item was how the world was 1deg warmer than normal all because of CO2 they even put up a graph that looked a bit like a hockey stick. Then on came the weather and Jim Hikey the weather man put up all the November weather stats for NZ and guess what we were 1 deg colder than the norm.After tea i was reading the local Southland rag and the lead story was how because of the cold and wet that farmer’s were having a bad time of it this year as nothing was growing well, observation trumps science every time. People are starting to look around and see the propaganda spouted by the MSM just doesn’t match reality. Also if they check they find It was cold and snowy in the USA, Canada, Russia…. Waist-deep snow in China – Most severe snowstorm in years in Fuyuan County, a border town in northeast China’s Heilongjiang Province. H/T to IceAgeNow who compiles all the stories we never hear. a few of the facts that seems to past most people by. #1. The Laurentide Ice Sheet actually left Alaska ice free and California with a temperate climate. #2. The shape of the northern ‘Polar Vortex’ this winter and last is the same shape as the Laurentide Ice Sheet. #3. Some where I read that the ice sheets didn’t form because it was cold but because of the amount of snow and if it is too cold you don’t get the snow. It takes the clash of warm moist air with cold polar air to create storms that dump 3, 4, and even 7 feet of snow at a time. Glaciers form when there is more snow laid down in the winter than is melted in the summer. In Scotland this summer ~300 snow patches remained. In some of these snow patches, researchers have come across compacted, dense, ice hard snow called neve, which is considered the first stage in the formation of glaciers. #4. The media completely ignores the intense debate among geologists who study the ice age we are now in. At this point the winner should send a chill up everyone’s spine. Averaging temperatures of a complex thermodynamic atmosphere is physically meaningless nonsense. Adjusting temp records is even more nonsense.May they freeze in the next Ice Age (coming soon). Just for the record (US) source Iceagenow. Temperatures were below average across most of the country east of the Rockies for the first 11 months of this year. Temperatures were farthest below average in a swath encompassing the entire Mississippi River Valley and much of the Great Lakes, running 2 to 4 degrees below normal, according to the High Plains Regional Climate Center. So far, it’s been the eighth-coldest year on record in Illinois. Missouri, Iowa, Indiana and Arkansas are having one of their 12 coldest years of the past 120. There have been 47,402 record lows in the lower 48 so far this year, as opposed to only 33,013 record highs. For just the month of November, there were more than four times as many record lows (8,977) as record highs (2,022). Yes it has been darn cold in the USA this year. So cold the Great Lakes were ice free for only five months and were 6 degrees below normal in temp this summer.There was a near-record 92% ice cover over the Great Lakes last winter. This year they are freezing even earlier, with ice already forming as of Nov. 18 on Superior, Michigan and Huron. Political interest in the UN’s climate talks has shrunk this year, in spite of increasingly urgent scientific warnings and a tight deadline for signing a new climate deal. Although 190 countries are represented at the talks, only 119 will send a minister. This is less than two in three, and fifteen less than last year’s UN climate talks in Warsaw. The ranking of the delegates sent by a country to the UN negotiations can be seen as a barometer of how seriously the country regards the threat of climate change. In some cases, it can also indicate a lack of capacity to spare key figures for the talks. But Burundi, Malawi and Eritrea are making the effort, despite being among the poorest countries in the world. From the EU, countries sending ministers include the UK, Germany and France. Countries who will not be represented by ministers include Russia, Venezuela, Greece, Iceland and Indonesia. Seems like the climate catastrophe cadaver is just starting to stink and the lice are leaving. Rats desert a sinking ship! Actually, I suspect the ship is sinking because it wants to rid of the rats !! You can only get so many rats onto a leaky boat, before it will sink of its own accord. ! It’s been that way since the global warming catastrophe conference in Copenhagen got frozen out by record cold and snow. How many years ago was that already? 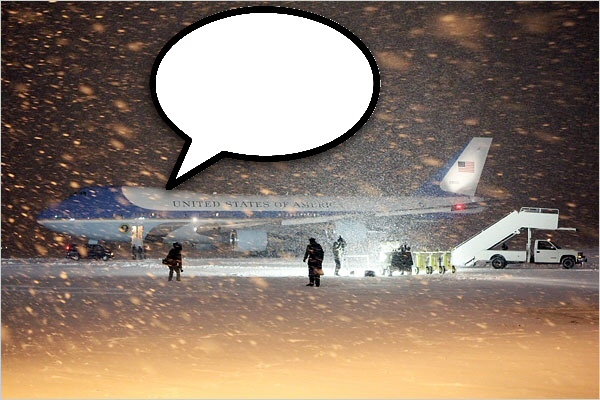 It was in 2009 that Obama landed back in Washington DC in a blizzard. With luck the same thing will happen again! From WUWT fill-in the caption contest. The three countries you mention are among the greatest leeches of western money;population increases due to aid – which is subject to corruptive processes-and they ask for more. In terms of being the greatest leeches of western money, do you mean: Burundi, Malawi and Eritrea? Or: The UK, Germany and France? I think the EU and the UN easily surpass anything any of those countries have done in the leeching department! Not even to take care of the UN-IPCC’s last rites? It seems to me that in this digital period, that weather presenters can come up with a “record” of some kind every day, which actually means nothing. Or why doesn’t BOM & MSM outlets show the Weatherbell Global Temp Maps. I just checked the map a few minutes ago and for the period Jan 1 to Dec 3 2014, the Global Temp Anomaly is + 0.108 degrees C. What does this mean? It means that planet Earth this year, with just 28 days remaining, is a mere 0.108 degrees C above the average temp for the period 1981 – 2010. And I recall the figure for 2013 was ~ + 0.05 degrees C. And the MSM has been saying that 2014 is likely to the hottest year on record, that is since records have been kept – what nonsense!!! Which temp record is the MSM consulting to come to this conclusion? So much “AGW Alarmism” out there. Remember Penny Wong some 5 years ago in her capacity as Minister for Climate Change & Water in the Rudd Govt, she issued a dire warning in the MSM that Global Sea Level [SL] was going to rise by 1.1 metres by the year 2100, flooding tens of thousands of properties along Oz’s vast coastline. She had an impeccable source – the Climate Commission headed by Dr Tim Flannery and his merry band of hand picked experts. So 5 years on how much has Eustatic SL risen? – how about ~ 10mm. Mmm!!! At this rate of SL rise then the rise by 2100 will be ~ 8.5cm not 1.1m, and that is not factoring in the imminent next LIA. Given that many Solar Physicists say that the next LIA will kick in later this decade, and persist for many decades, then once one factors in this LIA, then even a 8.5cm rise will be a big ask, in fact a real fall below the current Eustatic SL is more likely. Christiana Figueres is back-tracking fast – did someone tell her it was insensitive/insane to say $100 billion annually “is frankly a very, very small sum”? “We already know, because we have a pretty good sense of what countries will be able to do in the short run, that the sum total of efforts (in Paris) will not be able to put us on the path for two degrees,” she said. The mood at the Lima U.N. talks is far from the run-up to the Copenhagen summit in 2009, when governments tried and failed to agree a U.N. climate deal. At that time, many nations hoped for a sweeping new treaty. The long-term goal is to reduce greenhouse gases to zero by 2100, a target she says will require leaving three-quarters of fossil fuels in the ground. “We just can’t afford to burn them,” she said. 3 Dec: BBC: Why has the year 2014 been so hot? Q)I thought there was a pause in global warming? A)Global mean surface temperatures rose rapidly from the 1970s, but were relatively flat over the 15 years prior to 2013. Many studies have reinforced a link between uptake of heat by the oceans and the “pause”. The high surface temperatures of the Pacific and other parts of the world’s oceans might suggest that the pause is coming to an end, but there is no evidence yet to support this. Climate scientists need more than one warm year to discern underlying trends. Energy and Climate Change Secretary Ed Davey said: “More record warm temperatures in the UK and across the world are yet more evidence that we need to act urgently to prevent dangerous climate change. WWF UK chief executive David Nussbaum said: “With countries meeting in Lima to lay the foundations for a climate deal to be agreed in Paris next year, this is yet another reminder of how our global climate is already changing. The Oz anomaly may be so (and others) but globally John and Roy show the Nov anomaly as 0.33% which is on a very slightly rising two year trend according to Roy’s graph. It is difficult to reconcile the current anomaly with the notion of a hiatus. The 18 year pause takes account of 1998 but look at the last 14 years and the trend is clear. I appreciate that this is a very simple interpretation by sight of a single graph and I am playing devil’s advocate but I’d welcome criticism of my comments for no other reason than to add to my armoury of anti warmist arguments. The cause of the trend is another matter entirely: no-one will ever convince me that the climate changes we observe are man made. The carp being pushed by the UK msm, especially the BBC, about “the hottest year ever” is akin to Nazi Germany and Soviet Union propaganda at its worst. When the anomaly is over 16C then get back to me. Why 16C? Because that is the type of temperature change seen with Dansgaard-Oeschger oscillations. Until the temperature change is greater than that OR the Climastrologists can accurately explain Dansgaard-Oeschger oscillations and show the same factors are not happening today, they are just blowing smoke. Climate science is nothing more than a corrupt business venture and they keep two sets of books. The land based temperature data ledger is the one they want the public to see. The satellite data ledger is the real one they keep fro climate accounting purposes just in case they need they need real data for something other than to promote their reason for existence. Why? Because it is always about the money. No dire emergency equals no funding! I looked at you web site. Or at least you imply that it’s yours. It pushes oil and gas investment, which is OK with me. But almost 20 years ago I lost a lot of money in natural gas because the price stayed down instead of doing the expected. And now natural gas is more plentiful than ever and the price is going down again or staying where it is. And I wonder, who is it that’s making such huge gains in gas as your site implies? I know you’re in the business so you’re an insider. What’s the real picture with natural gas? Owning wells or having an interest in them through a partnership was definitely a loser when the price stayed down. So how does one get rich on natural gas? The voluminous writings (nineteen books and thousands of essays, articles and reviews) of H. L. Mencken, one of America’s finest writers and perhaps its greatest journalist and chronicler of American English, are a virtually-forgotten treasure trove of sparkling wit and deep wisdom. could this be the funniest CAGW piece evah! Recent meetings have failed to make significant progress. Yet, this year there are high hopes that the US-China climate deal and the New York UN Climate Summit will allow Lima to provide a stepping stone for a binding emissions agreement at next year’s meeting in Paris. Vested interests such as the Koch brothers in the US and other conservative forces have cleverly exploited this unconscious response by supporting a small group of scientists, politicians and think tanks to spread the message of climate scepticism and denial. This is also true for those climate experts who fly around the world, going from one global climate change summit to the next. The very carbon emissions associated with their work can be seen as part of a denial strategy. In fact, one could argue that those who are very close to the reality of climate change are particularly prone to a need to split their identity. The knowledge they have, and the images they have seen, might unconsciously lead them to the above-mentioned counter-balancing and coping behaviours. Not a good omen for the latest round of climate talks in Peru. That piece sounds like an inching away from the rotting corpse of CAGW. Al Gore crept away two years ago and divested his portfolio of ‘Green Energy’ – wind, solar, biomass and other alternative energy – in favor of natural gas. Think he might know something we don’t? Just before that in 2009 Warren Buffett’s Berkshire Hathaway dumped $44 billion in to rail roads. Any wonder why his good buddy Barack Obama is vetoing natural gas pipelines? The World is on-course , of course, for a last ditch, pull out all the stops, bid for climate insanity in Paris next year. It’s not only climate science, but does climate science attract more of them ? Ten years ago you would never have found such a cartoon to post nor would you I think have even contemplated posting such a cartoon.
. Science is no longer in most cases a proffession but has become an industry where everything is geared to making money and elevating your self or your organisation towards greater political and business influence and power and wealth. Science, particularly some branches of science, Climate Science being the prime example , one which is now dragging down with it all other branches of science in reputation and respect in the public’s eyes and increasingly in the political realms as well as it steps onto the scientific version of the Olympic down hill ice racing Luge where there is no stopping until you hit the bottom or seriously crash. Like water dripping ona rock, no apparent impression or effect is ever seen from this increasingly skeptical view and questioning of the science industry. But come back in a few years or a few decades later and there have been big changes to that rock as that steady drip eats away at that monolithic rock structure. And so it is with the increasingly skeptical viewing and questioning of monolithic science. Scientists are no smarter, no more intelligent, just as dumb, idiotic, naive, stupid, smart, clever, vicious, ethics lacking, thieving. criminal and etc as anybody else off the street or in business, law, politics, banking or any other proffession and job you would like to name. They are after all off that same street as the rest of us human beings. They have just honed their public persona through academic experience and training to appear to be smarter than the rest of us and it now clearly shows in this last generation or two of scientists just how far removed they are in their undeserved hubris and arrogance from the ordinary common man who is forced through no fault of his own to pay these scientists their lavish salaries usually earned without ever having to justify or be audited on the quality and quantity of the science they claim they are creating. The great god of science set for the last century or more high up on it’s pedestal in public esteem is crashing to Earth. And for this there is nobody else to blame except the scientists themselves. I, as a chemist, may print that cartoon out and send it to my university the next time the come begging for $$$ from Alumni. When I see their “Sustainability” Page it really angers me. Where I live the last 3 years have been unusually cold, even in spite of hot summer months when we ran air conditioning. But this year has turned around with a hotter summer and warmer fall than usual. The heat went well into November which is really unusual. Rain was lacking in those prior years but this fall we’ve already had 3 days of steady rain, not heavy, but steady. That much rain is also unusually early. And the forecast seems to be for more to come. What am I to conclude from all this? Only that the weather does what it wants to do, not what I want it to do or suspect it may be doing. I haven’t any data on local records except what I keep track of myself because no one keeps records on this one small piece of California. But I still remember the first week of March, 1962 when I spent a week of leave from the Army at relative’s home not more than a mile from where I live now. The temperature at the beginning of march might reach the 80s (F) but that entire week topped out at 100° or more every single day. That has never repeated itself. In the meantime, 2 years ago I woke up one morning and my outside thermometer was reading 29°, the lowest morning temperature I can remember seeing. The only conclusion you can reach from the variability of the weather is that the weather is variable — circular reasoning I suppose but the truth. The BOM is a public service organization and like the ABC, supposed to be apolitical. Global Warming is a leftist construct which has never been science, if stable global temperatures for the last two decades mean anything. So someone in the BOM is tasked specifically with preparing and releasing official news alerts to the media in general and it is clear the instruction is to publish anything to do with heating, especially record heating. Nothing about cooling is to be mentioned. If there is no news, they have to find something so they go to the scientists and someone has to come up with a record heating somewhere, somehow. Why is this being done? Who ordered it? Is this a direction from the management of the BOM? Who is tasking people with this and providing funding and time specifically to promote warming news? Or are they simply enjoying a period of unprecedented interest which is only in warming and so respond to market demand? How do they justify pushing this line? Is it driven by the leftist warming media where the manufactured news outlets like Fairfax, the ABC, the Guardian calling every day demanding more and more dramatic warming news? No cooling news please. Has the BOM become an unintended warming organization or is it the explicit direction of the BOM management to push warming because it equates to publicity and that to increased funding? Or is it all of the above. At what point did the prosaic business of simply measuring and reporting the weather become the political and financial plaything of people with an explicit political agenda? Or is it that the staff of the BOM are collectively highly politicized Green sympathisers who will do what is required to push their political views, that Western Capitalist society is corrupt and destructive and needs to be punished and bankrupted, for the greater good of course. The correlation between adjustments and CO2 is near perfect! Come on gai, you know its purely coincidence that the R2 = 0.99 !! It seems this is how modern Science works. Darn , you beat me to it, Bernard !! OT, but this seems to be a good case of modern scientific activism. Four scientists collude to write papers to get a pesticide banned. ! Steve McIntyre continues to pull apart the infamous PAGES 2k study and some more of the doubtful dendro studies. There is a difference between the surface temperature and the satellite temperature. I had always assumed that most people in Australia living on the land surface. Soldiers and police were deployed to supply some 5,000 residents with heaters, blankets and generators. “I’m fortunate: at home we have a wood stove and 100-year-old well, so we’re okay for heating and water. I dug out an old oil lamp so we have light and we’re charging the cell phone on a car battery,” said Majdanpek metal worker Petar Radulovic. In 49 years of records, more snow covered the Northern Hemisphere this fall than any other time. The ceremony was moved indoors because of cold, wet weather that blanketed Washington. I count more than two turkeys in that story. including “Does this tell us anything about global warming?” in the heading is a CAGW giveaway, Deutsche Welle! 4 Dec: Deutsche Welle: Irene Quaile: Thicker ice in the Antarctic: good news for the climate? New measurements in the Antarctic show the sea ice is much thicker in places than previously thought. Does this tell us anything about global warming? While Antarctica’s ice sheet, that is the land ice, is melting and retreating, the extent of the sea ice has been expanding over the last three winters. This has led some climate change skeptics to suggest that it could be evidence that human-made global warming isn’t happening. But sea-ice physicist Stefan Hendricks, from the Alfred-Wegener Institute for Polar and Marine Research, based in Bremerhaven, Germany, told DW the new measurements were no reason to doubt climate change. The new measurements certainly do not give any reason to be more relaxed about climate warming, says Hendricks. Increased sea ice could have a cooling effect, as ice reflects heat back into space, whereas the sea water absorbs the heat, exacerbating warming. But given that the ice melts again in summer, that effect would be very slight, says the physicist. OH good grief, I wish they would quit trotting out that LIE. A tiny portion of the Antarctica’s ice sheet is melting because it has active volcanoes under it! During 2003 to 2008, the mass gain of the Antarctic ice sheet from snow accumulation exceeded the mass loss from ice discharge by 49 Gt/yr (2.5% of input), as derived from ICESat laser measurements of elevation change. The net gain (86 Gt/yr) over the West Antarctic (WA) and East Antarctic ice sheets (WA and EA) is essentially unchanged from revised results for 1992 to 2001 from ERS radar altimetry. Buried under thick ice and frigid water, volcanic explosions are shaking the Arctic Ocean floor at depths previously thought impossible, according to a new study…. You might already know this, but Melbourne is about to get cooler, courtesy of the BOM changing its official “Melbourne” recording station to a location at Olympic Park on the edge of the city. The previous official city site, on the corner of Victoria Avenue and Latrobe St and surrounded by tall buildings, busy asphalted roads and tram lines, has been increasing contaminated by the UHI effect over its 106 year record. The Bureau has been operating the two sites in tandem since June 2013 for comparison purposes and the Olympic Park site became “the official point to which the ‘forecast for Melbourne’ refers” at end November 2014. It’s no surprise that the Olympic Park site has been recording daily and monthly average max temps around 1 degree C cooler than the previous site and more in line with other stations in and around the Melbourne area. The BOM had admitted that the wind recordings at the previous site had “progressively deteriorated” because of the buildings constructed around the city but has not acknowledged any other probable locational skewing of its recordings. It will be interesting to see how the BOM plays this shift in location. Most particularly the 1C difference in the temp data between the locations. If the BOM just changes the location but continues on with the current station data stream it introduces a very significant break point , a sudden spike or sudden fall in the temperature data fin that station’s data. Break point adjustments are one of the reasons behind the large and vitriolic reactions of most observers of the climate temperature trend adjustment regimes. When a break point occurs, such as trimming trees around the station and a small temperature trend change resulting, installing a nearby footway, shifting the station , painting the screens and etc all of which are known to create break points in the stations temperature data which is picked up by the algorithms and the adjustment made without humans overseeing them, the station data is adjusted to eliminate the break point and give a smoother trend line. And THAT is when we start to see all these claims of record temperatures as a UHI effect over some years slowly increases the temperature readings from a station, the station is shifted to a less UHI influenced location [ Guess what ! ] and a significant cooling break point is created. Which then means that all those past temperature readings for that station in the data banks, every single one of them is adjusted downwards in this case therefore cooling past historical temperatures i and providing an apparent record warming of the present temperatures. I suggest anybody intersted in this very basic and completely common sense deficient, data corrupting, global warming supporting means of adjusting temperatures should read both these posts below. There’s a quote from Zeke Hausfather who is deep into the BEST project in this WUWT post which is quite enlightening and the mind boggles at the total inanity of this sort of scientific incompetence and corruption of data. Data after all as has been said many times is sacred. Jo, Western Australian Federal Minister for Foreign Affairs and Trade (DFAT) has returned from Lima and has apparently told a Fauxfacts journalist that she would like Australia to commit to a higher level of emission reductions before the next Paris meeting. Somebody needs to have a word with her about global warming being a non event, and soon. It is worrying to discover that such a capable person can be so ignorant of climate truth. The propaganda has had an extraordinary impact on society, with otherwise intelligent people falling into the pit of ignorance. Was that what she told the Faux-facts journalist, or was that what the Faux-facts journalist thought she said, or was that what the Faux-facts journalist wrote before the interview in order to meet his or her deadline? Timing and intent are highly important, in such matters. Well worth a read if you have the time and the capability. Why bother about warming or cooling? Climate change is not about CLIMATE. To know what it is about, read: New Emperors’ Novel Clothes: Climate Change Analysed (connorcourt.com).